The February 2019 Jaguar Club of Southern Colorado event will be a brand new “What’s in your garage” visit in Pueblo scheduled for February 9. We will meet at the K-Mart store parking lot, 3415 N. Elizabeth in Pueblo at 10:00 A.M. If anyone wants to meet in the Springs and drive to Pueblo as a group, please let me know. Following the tour, we will have lunch at the El Nopal restaurant also in Pueblo. If there is enough interest, we can visit the Pueblo Heritage Museum following lunch. The Heritage Museum admission is $4.00 per person. If you would like to attend this event, please RSVP to Events@JagClub.org as soon as possible so we can begin planning. For 2019, the JCSC would like to begin exchanging cell phone numbers for event attendees so we can communicate any last-minute changes to our guests. I will send a follow-up memo in a few days with the phone number of the tour guide. Please don’t forget the JCSC will conduct the first quarter Membership Dinner at Fargo’s Pizza, (2910 E. Platte Ave, Colorado Springs) on February 13th at 6:00 P.M.
For questions, comments or directions, contact us at Events@JagClub.org. This entry was posted in Club Events on January 29, 2019 by Dan Martin. Everyone, please note that Jack Quinn’s is NOT available on February 13th so our club meeting will be at Fargo’s instead. Fargo’s Pizza Emporium – February 13th at 6:00 P.M. We’ll look at Jack Quinn’s forn March. This entry was posted in Club Events on January 22, 2019 by Dan Martin. The Annual Membership and Board meeting of the Jaguar Club of Southern Colorado (to include the Election of Board Officers) will be held on Wednesday, November 7, 2018 at 6:00 P.M. at Fargo’s Pizza Co., 2910 East Platte Avenue. This entry was posted in Club Events on October 14, 2018 by Dan Martin. Greeting Jaguar Club of Southern Colorado! I-PACE at our dealership for exclusive test drives for our clients and club members until Thursday, September 6th. This entry was posted in Club Events, Jaguar Designs on August 28, 2018 by Dan Martin. 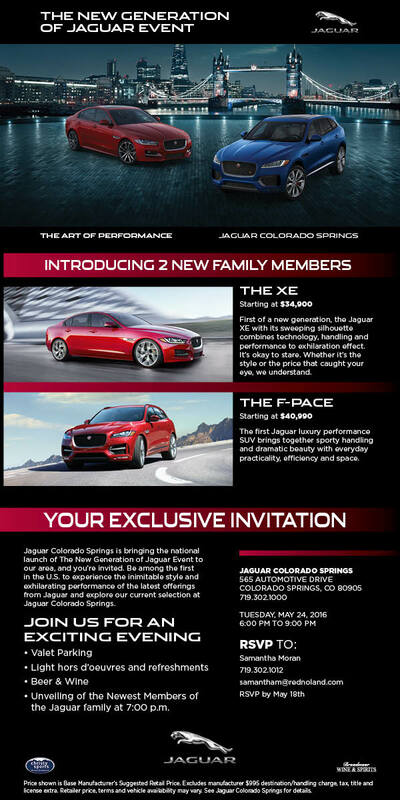 Jaguar Colorado Springs is providing the membership of the Jaguar Club of Colorado Springs and the Rocky Mountain Jaguar Club an opportunity to attend the national launch of the new Jaguar XE and F-Pace at the “New Generation of Jaguar Event” on Tuesday, May 24, 2016 from 6:00 to 9:00 P.M. The launch will be right here in Colorado Springs at the Jaguar dealership in Motor City. Details of the event are outlined in the attached invitation. Please RSVP to Samantha Moran via the provided email address or telephone number. If you would like to bring your Jaguar for display at this event, let Samantha know when you RSVP. Please consider attending this event as a show our Club’s support of Jaguar Colorado Springs. This entry was posted in Club Events on May 10, 2016 by Dan Martin. See Shelby Cobra Daytona Car at Shelby Museum/Avery Brewing Winter Drive? Will we find this International Historic Motoring Awards Winning Car of the Year (1st American car to win, sponsored by Octane) Shelby Cobra Daytona Coupe CSX2287 there on the 17th? I’m not saying. Either see for yourself or inquire afterwards and wish you had been there. This entry was posted in Club Events on January 5, 2015 by Dan Martin. 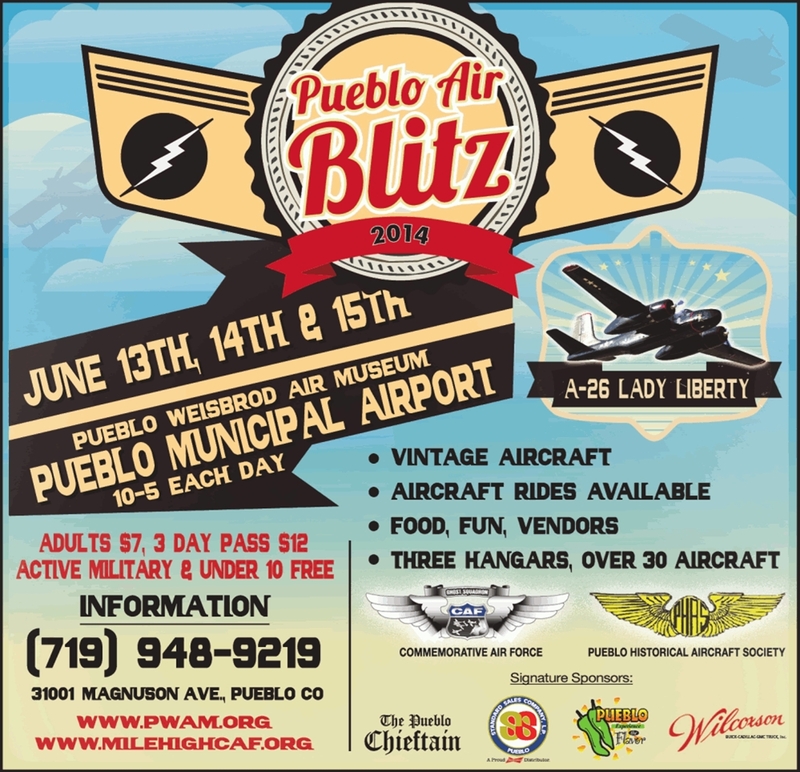 The Father’s Day, June 15, is rapidly approaching and what better way to spend the day than at the Pueblo Air Blitz air show along with the Jaguar Club of Southern Colorado. We plan to meet at Jaguar Colorado Springs around 8:45 A.M. and caravan to the Pueblo Airport for the air show and to visit the Weisbrod Air Museum. Following the air show, we have reservations for a late lunch at the Gold Dust Saloon (www.golddustsaloon.net or 719-545-0741 for information on the Gold Dust) on the River Walk, 217 South Union Blvd, in Pueblo. If you have not already sent an RSVP to me and plan to attend this show with the club, please let me know within the next day or two so we can confirm all reservations. This entry was posted in Club Events on June 9, 2014 by Dan Martin.